The previous Bahrain Grand Prix was an entirely new experience for the drivers, engineers, organizers and fans. Barely hours after the race, plethora of doubts over the new refuelling ban was in the air. One thing I’m sure it was not good for Formula 1. The reason I write this piece is to re-explore if you recall all those brouhaha regarding Virgin with their philosophy of only using CFD as the only aerodynamics design tool. Virgin Racing’s technical director Nick Wirth says his team’s performance at the Bahrain Grand Prix justifies its all CFD design philosophy. Well, can you agree with him? Sunday afternoon in Bahrain, with both cars finishing the race, Heikki in 15th and Jarno in 17th, Lotus Racing established themselves as the best of new teams. Every single target they have fixed have been met. So it’s really good sign for Lotus Racing. Although towards the end of the race Jarno had hydraulic problems, he still managed to bring his car home. With no refuelling, the time spent in the pit is now dramatically reduced. Although Ferrari has confirmed competitiveness this season by a 1-2 finish, the highlight was the failure of ban on refuelling. With the most anticipated season ever as far as I can remember, the race failed to live up to the expected built up drama. The rule which is supposed to encourage overtaking this season has done exactly otherwise. Ferrari finish 1-2 with Alonso and Massa. Hamilton take 3rd place. Vettel suffered reliability problem after dominating from pole half way into the race. Stay tuned with us while we write our insights on the race. In the meantime enjoy some of the action from Bahrain. Take note of the small snorkel near the area of Lewis hand. Just as I write a piece titled F1 Engineers and their Cunning Stunts , here we are at it again. A brilliant McLaren innovation. Simply mischievous and clever. 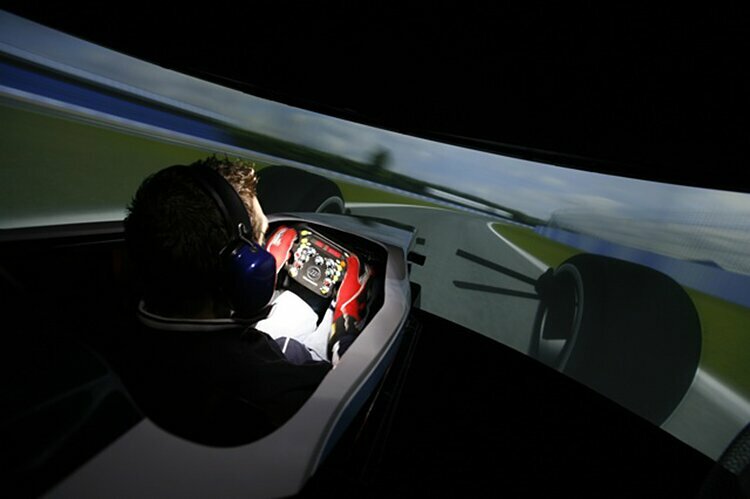 Just as a pilot needs to undergo a rigorous test in simulation for hours, F1 driver has been taking that step too in this modern times. With test severely limited, driver training and experience have become expensive commodity. Nowadays, with the limited test, teams would want to optimize scarcely available track time by developing the car and spent less time on driver development. Hence, only race driver will get the seat time these days. As a result, there is not much room for young talent to breach F1. If any race driver is injured, the standby driver is not optimized to replace the seat. Looking at this factor, safety of the new and the rest competing drivers are at risk. So let’s look at solutions teams are beginning to adopt.